A couple summers ago, I had the privilege of telling stories for two nights in a fabulous location - the parlour of the Cape Spear Lighthouse National Historic Site of Canada. The building, which is the oldest surviving lighthouse in Newfoundland and Labrador, was the perfect spot for telling some local legends. Given its oceanside location, I elected to tell stories of sea monsters, of which we have a great tradition in this province. One of the written accounts of a miraculous aquatic beastie off the shores of Newfoundland may date back to around the year 560 AD. It involves one of Newfoundland’s possible first European tourists, St. Brendan the Navigator, who made a seven-year voyage across the Atlantic Ocean in a curragh, a wood-framed boat covered in sewn ox-hides, travelling to a new land and returning home to tell his tale. While exploring the North Atlantic, the good Saint’s brethren begged him to stop somewhere and celebrate the Easter mass. Sure enough, when Easter came with no land in sight, a miraculous event took place. After sailing for days without sight of land, an island suddenly came into view, very little wood or grass upon it, and no sand on the shore. The monks spent the night in prayer outside the vessel, Brendan remained on the boat. The next morning, after the priests had celebrated Mass, the brethren took out some uncooked meat and fish, and put a cauldron on a fire to cook. When the cauldron began to boil, “the island moved about like a wave.” The monks rushed back to the boat, where St. Brendan pulled them back onboard. As he did so, the “island” lifted up its great tail, and swam off into the distance. Jasconius the whale was not the only sea creature the monks came across during their travels. 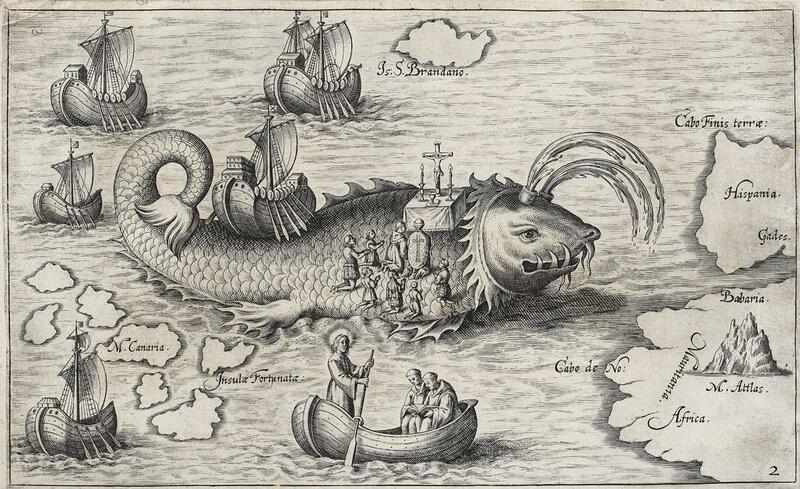 One day a sea monster appeared swimming after the boat, spouting foam from its nostrils. Fearful that the beast meant to eat them, the monks cried out to the saint for help. No sooner had the saint said these words that a second monster rose into view, this one spouting flame from its mouth instead of foam. It attacked the first sea creature, cutting into three pieces, before vanishing back under the briny depths. As an addendum to the story, the monks found the pieces of the first monster washed up later on a nearby island, and under Brendan’s direction, they cut away enough fresh meat to last them for three months. In 1976, British adventurer and historian Tim Severin built a replica of the saint’s curragh, and sailed it from Ireland to Newfoundland, demonstrating that the legendary voyage could have been possible. Sea monster steaks, however, might not be appearing in St. John’s restaurants anytime soon.